TABlog interviews Oron Catts, one of the artists behind the Tissue Culture and Art Project. 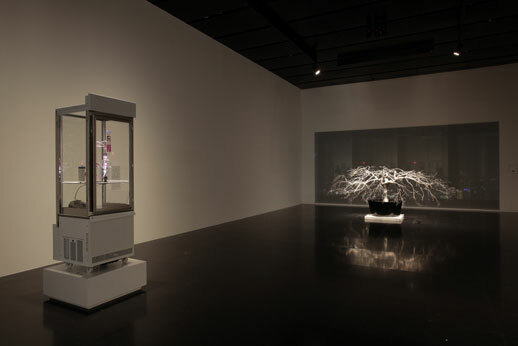 Oron Catts is currently the director of SymbioticA, a center in western Australia that promotes and hosts artists’ use of the kind of “wet” laboratory procedures usually limited to the biological research labs, in an effort to engage the critical and demonstrative aspects of art-making with the big issues embedded in science and technology. With his partner Ionat Zurr, he creates artworks using semi-living tissues that he cultivates. 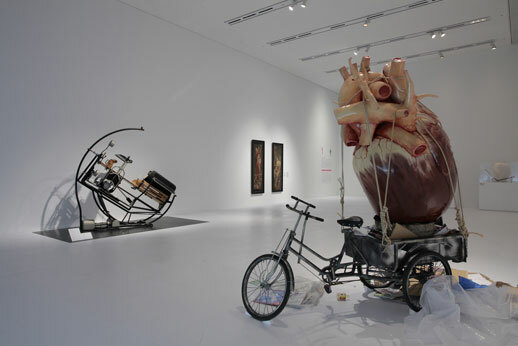 Their piece ‘Victimless Leather’ is part of the Mori Art Museum’s show “Medicine and Art”. Clearly you are deeply involved in issues of life, but you started your career as a designer. What led you from the study of design to your engagement with living systems? In the early Nineties, when I was studying design, I started to realize that there were more and more engineering approaches that started to engage with living systems. If you follow this logic, you could assume that once that happens, biological technology would need designers to design their products. Once the engineers move in, the designers would follow shortly after. I was looking at different ways in which that might happen, and one of the technologies that had just started, reported in a paper published in 1995 in Science, was tissue engineering. Shortly after that a striking image of a mouse with a human ear growing from his back hit the media. To me this represented the very disturbing possibility of being able to sculpt with living tissue. So in the late 1980s, we were told that we were very close to being able to replace a failing heart with a mechanical pump. Then, come the mid-nineties, tissue engineers promised that they would eventually be able to grow a fully functioning heart outside the body in order to replace failing hearts. I was, in a sense, reversing the logic of tissue engineering. I thought, if we were told that we could replace the heart with a pump, and then we are told that we can actually grow a heart, why not grow pumps? So the idea was: why not use this promise of the regenerative powers of the body to create what we started to call semi-living entities, or products? The promise of being able to create functional tissues that can be sustained outside the body I found both exciting and challenging, and a very disturbing proposition, and I decided to pursue this research as art research, as opposed to design. This is because I believe that art is better at problematizing things, keeping them unresolved, and engaging with issues rather than trying to bring closure to them, which is, in most cases, what design tries to do. It was way too early to propose this approach as a solution. Rather, even now, fifteen years later, I still feel it is a very problematic proposition that needs to be explored further. I am interested in how you use the discourse of art to problematize the discourse of science. Do you find that having your work end up in a museum is the best way to fulfill your goals? Well, first off, my interest is in Life, not exactly in science. It just happens that the most radical things occurring in the issue of Life are in science. Meanwhile, our cultural perceptions of Life are inapplicable to our understanding of Living Systems in science. Decisions being made about Life are increasingly made in the very specialized field of science and engineering. Because art is open-ended, I think it is big enough to accommodate these kinds of issues. Of course, art has its own problems, and our work is often misunderstood both in curatorial text and in public understanding. Though science has the justification that is saving lives, our work has nothing to screen it from direct public view. We are engaging directly with these ideas in an effort to problematize them. Seriously, I think there is always the perception that art is not effective, but at the same time, we are trying to tell a non-verbal story about things we don’t even have a language to describe, and I think that art is the only way we can do it. That said, our work is not commercial, it is not collected, and it exists more in line with performance than as permanent work to be bought and sold. I try to make works which make me uncomfortable. If I am uncomfortable, there is something worth pursuing. For over fifteen years, you have been engaged with creating semi-living systems. How does this affect the way you think about the fully living systems you have created, i.e. your two daughters? Well, I didn’t have children before I was working with semi-living systems, so I can’t compare how my attitude toward fatherhood would be different. But certainly, on the other hand, having kids changed our idea of our work. We always spoke of the necessity of having to care for our sculptures. The first time we created a fully automated system in our work (as opposed to one which needs regular intervention and care) was the year our daughter was born. Having kids makes you very aware of the enormity of care. We are quite aware of our responsibility toward the creations we make, now as parents more than ever. 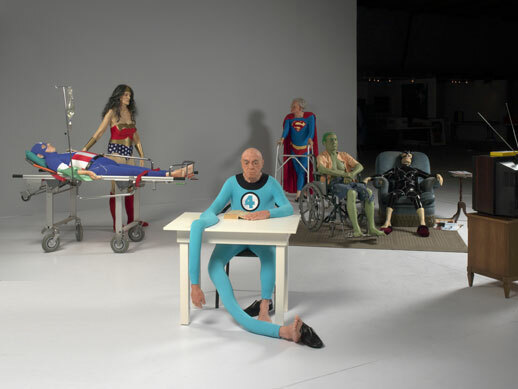 But in the example of the piece at MoMA, that sculpture was killed, right? How does that reconcile with the notion of responsibility to that work? Killing the pieces is a part of the work! In other situations, when it was the appropriate time to kill the pieces or to stop them from living, we have had killing rituals, where, for example, we would invite audiences to come and remove the tissue from its sterile conditions, and have them touch the piece to death. The convention in galleries and museums of “Don’t touch the art” is of course engaged in a much more problematic way here. Some tissue we use is grown from animal cells we cultivate from meat that comes from a butcher shop. When these tissues are later killed, we are paradoxically returning the tissue to its original place in society, as dead meat. This is a purposeful engagement with social understanding of where living tissue and dead tissue belong. Is there something intrinsically different about life versus other material? This is a fundamental question, and that’s why in our work, the issue of discomfort is important. 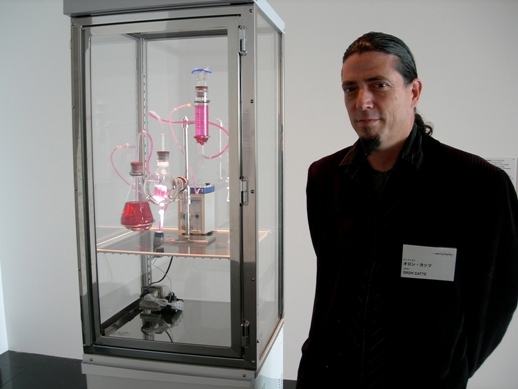 For more on Oron Catts, visit the Tissue Culture and Art Project homepage.